Today's full moon is a Blue Moon, which means it is the second full moon within a month. This particular full moon is in Aquarius, an Air sign (the Water-Pourer). Many wonderful astrologers have written about this event (see here and here), and I decided to work with Plant Spirits for my own healing this evening. I have struggled with skin issues my whole life, and at 34, I still find it incredibly annoying that I get breakouts and acne. Ugh. When walking through my garden, both Lemon Balm and Rosemary talked with me and told me to make a healing brew with each of them. I poured Witch Hazel, a good skin toner, over the herbs, said a few prayers, and sealed it up tight. It will stay in a cool, dry place from Full Moon (July 31) to Full Moon (Aug 29). Afterwards, I will strain it, pour it into spritzer bottles, and use it to help cleanse and tone my skin. This weekend, I will be in the mountains of Virginia, learning how to connect more fully with the Earth Mother and all of her creatures. My skill set and spiritual work surrounds People, and how to empower them in order to go forth more healed in their lives. But my personal spirituality (Druidry) involves working with the Land and the Nature Spirits, and the connection that comes when social structures fall away. This weekend will be filled with drumming, singing, self-healing, connection, inspiration, and Silence. I am looking forward to time away from the stresses of modern-day living (i.e., technology, paying bills, etc. ), and letting all of the wacky thoughts in my Monkey-brain die down to a gentle hum in the background. What sort of mini-retreats do you enjoy? How do you re-connect to Nature after long workweeks? In shamanism, the voice is one of the most powerful tools for healing. It contains breath, moisture, sound, vibration, and words, and it is the medium through which Soul Essence is blow back into the body. For me, it is my primary healing modality. My sacred songs put me into trance, and I use a diatonic scale to help each chakra find its normal resting state. I sing to distract intrusions, to call out to Helping Spirits, to dispel glamours, and to re-focus my own mind when I'm having a hard time concentrating. 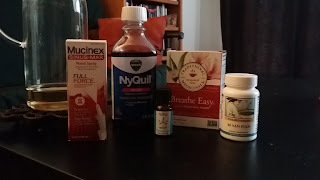 My voice and its care are of paramount importance to my work, which is why it is so incredibly frustrating when I am sick with a head cold. Schedules have to be re-arranged, appointments moved to new dates, and everything goes into flux while I wait and see how long it takes me to heal. It always brings great anxiety (as a self-employed full-time shaman), but healing cannot happen unless I am healthy first. Pictures from my lecture in Ohio! Last week, I presented my lecture, Differentiating Mental Illness from Spiritual Experience, in Columbus, Ohio. A good group attended, even during the holiday weekend, and we spent three hours discussing our own experiences. For the first time in three years, I was filmed during my presentation. I am hoping to turn my lecture and notes into a DVD, for use in clergy programs, universities, etc. I am starting the process of turning this into a book, which is exciting and overwhelming in its own way. Here are a few pictures from the workshop, for your enjoyment. Stay tuned for information about the upcoming DVD! 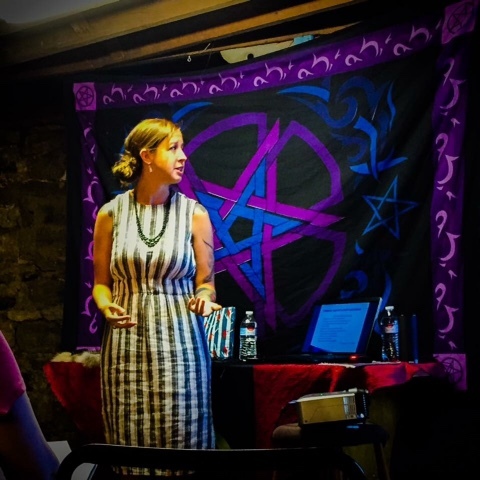 (Lecture held at The Magical Druid, an amazing pagan store on High Street, just north of Main Campus, OSU). Upcoming Lecture in Columbus, Ohio! This coming Sunday, July 5th, I will be presenting my lecture on Differentiating between mental illness and spiritual experiences. It will take place at the Magical Druid, located on High Street, in Columbus, from 1pm to around 4pm. The lecture is open to the public, and the Facebook Event can be found here. I've traveled to the greater Maryland & Virginia areas for conferences and workshops, but this will be the first time I'm heading west for a good 7+ hours of driving! I begin my drive to Ohio early tomorrow morning, and I am excited to spend the holiday weekend working with my friends, visiting family, and conducting healing appointments.